When interior designer Leanne Ford began working on a client's childhood house, she was given the leeway to reformulate the aesthetic — one that was decidedly outdated. "[The clients] had not really touched this home at all when they got it. It had the same style, the same art, the same furniture as when they bought it from their parents," Ford said. Of course, there was a bit of nostalgia to consider. Because the client had fond memories of the modern 1981 structure, located in Sewickley, Pennsylvania (a suburb of Pittsburgh), Ford and her team decided to leave the architecture unchanged. So the first steps were cosmetic. "A little paint goes a long way," Ford explained. After fresh paint, her team installed new floors and added wood to the ceiling to create a feeling of warmth. The final design isn't any one style, but draws on a mix of minimalism and traditional decor, framed by natural textures. In short, a timeless aesthetic that welcomes the next generation. White walls matched with a white sofa reflect the natural light flowing through the windows. 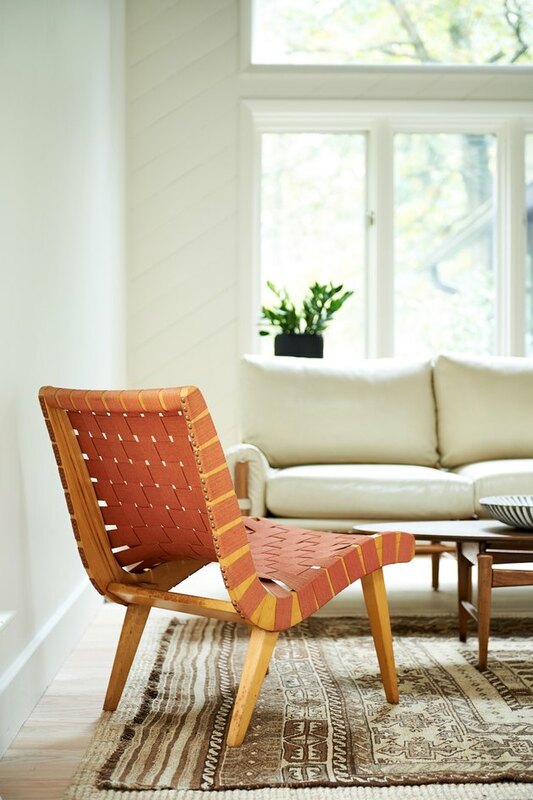 A natural-toned rug from Weisshouse and woven vintage Pierre Jeanneret chairs furnish the living room. The general layout was kept the same to reflect the home's past life. "We didn't fight the shape of the house," Ford said. "We went with it and turned the ceiling into the feature." Hanging from the living room ceiling, a large gold dome pendant from Restoration Hardware reflects similar styles found throughout the space, including vintage wall sconces in the kitchen. "This house was built in 1981 and looked very '80s," Ford said. By using vintage furnishings in a modern way, the redesign took on a timeless appeal. A mix of chairs, including a vintage wooden Thonet Mundus chair, surround the wood dining table. 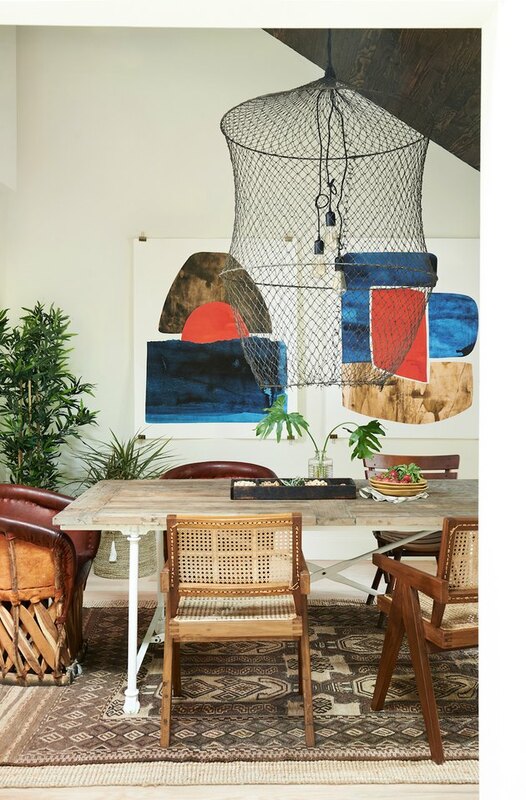 The light fixture was made by draping a vintage fisherman's net over a three-socket pendant light. The white walls are adorned with artwork by Alexandra Valenti. The metal chairs were hand-painted in Sherwin Williams' Decorators White — the same exact color used for the walls. 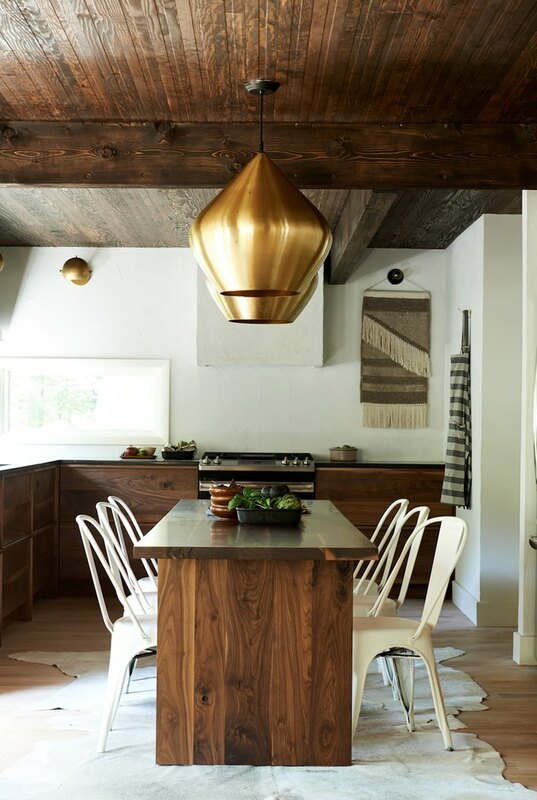 A gold dome Tom Dixon Beat Stout pendant hangs from the ceiling. 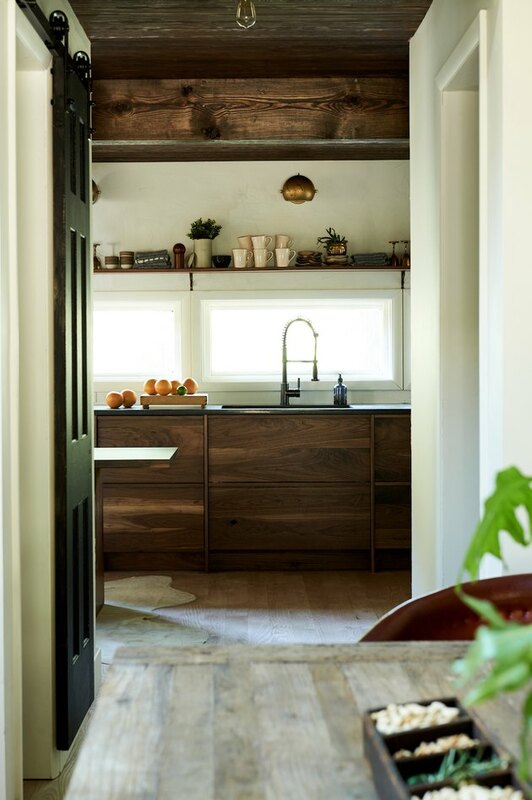 Ford knew exactly what the renovation needed, including "a new gorgeous, earthy kitchen," complete with a Whirlpool range oven. 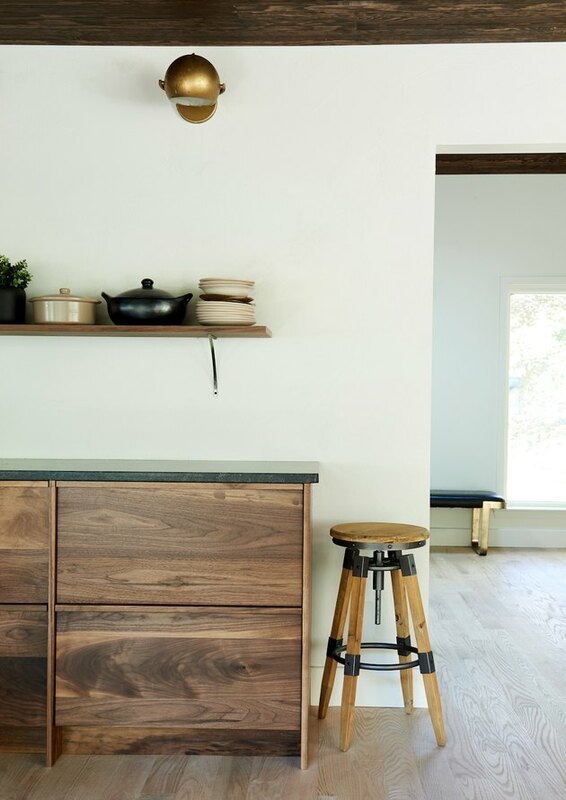 Local artisans Bones and All made custom black walnut fronts on the kitchen's Ikea cabinets. "They nailed it," Ford quipped. "Literally." A kitchen countertop in American Black Honed Granite from Armina Stone adds to the provincial atmosphere. 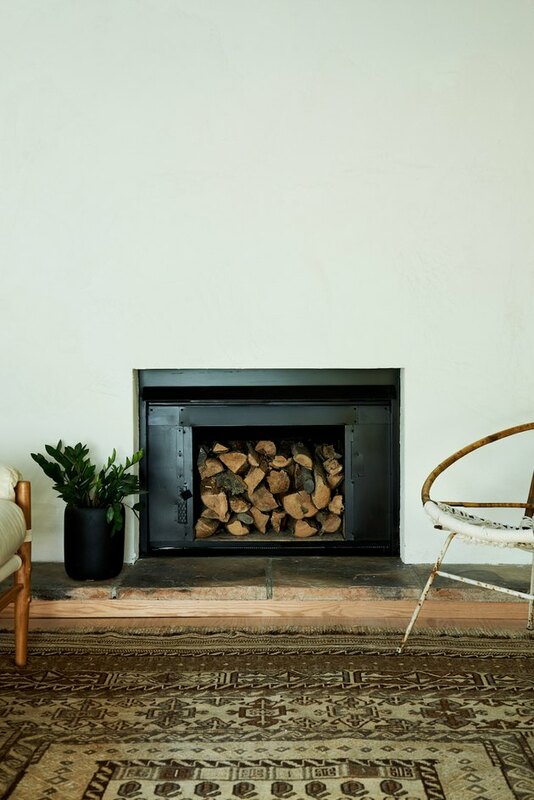 Red oak flooring and a combo of other dark woods help to offset the home's modern aesthetic. "We added wood to the ceiling from Baird Brothers to create dimension and warmth," Ford said. 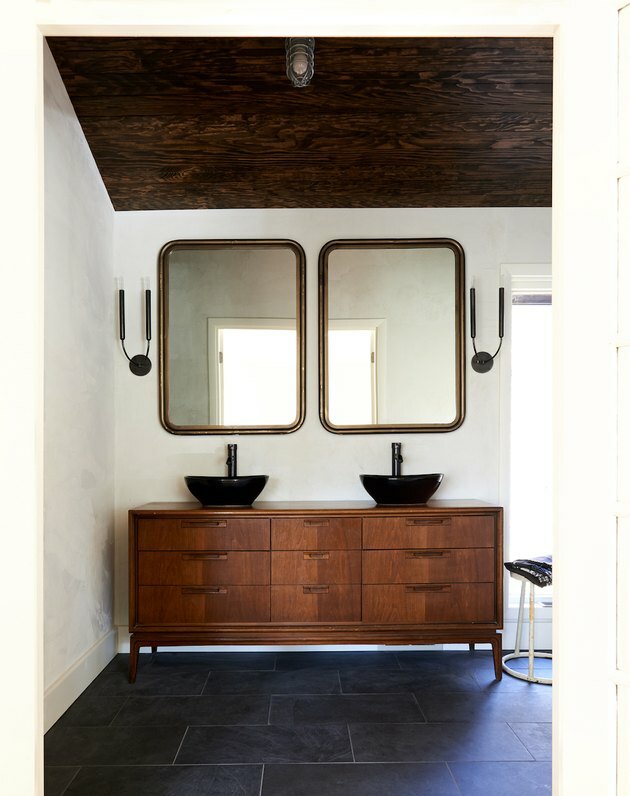 The wood ceiling continues in the bathroom, where Ford transformed a midcentury credenza into a vanity.